Fix usb flash drive that have chips bank chip vendor .Download Chips bank CBM2076 firmware update and repair your usb flash drive . Fixing corrupted usb flash drive is very easy to do .Sometimes when you open usb flash drive ,you get errors such as "write protected ,insert disk error , flash drive capacity is 8MB,Flash drive raw volume and can't format usb flash drive by windows format ". The solution is just update flash drive firmware .Today i bring firmware update for chips bank flash drive cbm2076 .Follow the next tips for fixing chips bank flash drive . You must be sure that your flash drive chip vendor is Chips bank cbm2076 . To know your flash drive chip vendor by using chip genius software , visit this article "How to repair usb flash drive in three steps "
Download Chips bank cbm2076 firmware from the link in the end of this article . 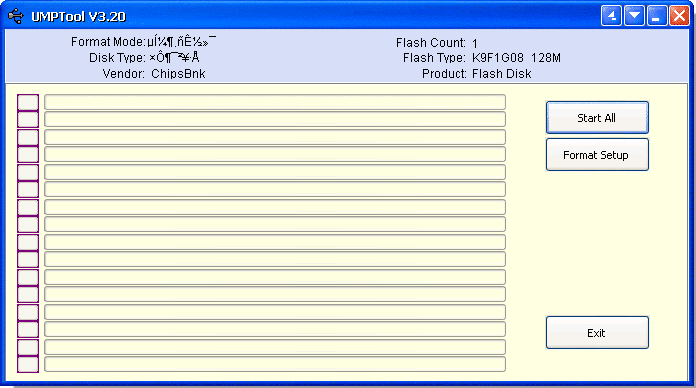 Insert corrupted chips bank flash drive to your computer . Open Chips bank cbm2076 software . 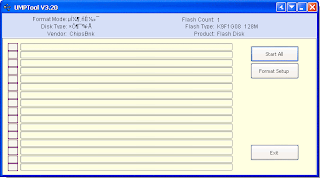 If your flash drive is chips bank , you will see flash drive information on the software window .Click Start all to begin repairing chips bank flash drive . Wait until finish updating your usb flash drive firmware . Congratulation , now your flash drive is like a new one . please share this article with your friends and if you have a problem with your flash drive , just leave a comment below with full chip genius report of your corrupted flash drive .